A triple-feature box set starring the martial arts superstar is coming to Blu-ray in October. In an early announcement to retailers, Vivendi has announced 'Jet Li Collection' on October 11. 'Fist of Legend'-International superstar Jet Li explodes on the screen in this thrilling martial arts action story about courage, honor ... and revenge! When Chen (Li) discovers that his beloved teacher and mentor has been murdered, he swears to avenge his death! Then, with an unwavering commitment to vengeance, Chen puts everything on the line to settle the score! The must-see modern remake of a Bruce Lee classic, FIST OF LEGEND packs hard-hitting excitement and incredible hand-to-hand combat into one unstoppable adrenaline rush! 'Legend Fong Sai Yuk'-In a time of oppression and secret resistance, the legendary folk hero Fong Sai-Yuk faces off against a bevy of dangerous rivals in a spectacular martial arts tournament to try to win the hand of a beautiful maiden. 'Tai Chi Master'-Superstar Jet Li shows off his legendary speed, power, and agility at the peak of his martial arts prowess in this sweeping action epic. In an age of swordsmen and rebellion, two best friends and fellow martial arts students are expelled from the storied temple of Shaolin, only to meet again on the battlefield one a power-hungry general, the other a freedom-fighting rebel, both mortal enemies. Featuring Crouching Tiger, Hidden Dragon s Michelle Yeoh and directed by the celebrated Yuen Woo-Ping (action choreographer of The Matrix films), Tai Chi Master is a quintessential martial arts classic. Specs and supplements haven't been confirmed yet, but suggested list price for the Blu-ray set is $24.99. 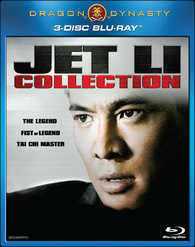 You can find the latest specs for 'Jet Li Collection' linked from our Blu-ray Release Schedule, where it's indexed under October 11.